Please go out of the north entrance ticket gate in JR Oosaki station and advance towards an east entrance (the right) district. There are a coffee shop and a flower shop in the way and the right side. Please turn left at a bump. Please retire from an escalator. Please go straight along the road. Please go up an escalator. Please cross a pedestrian overpass. A left building is an art Village Osaki Central tower. 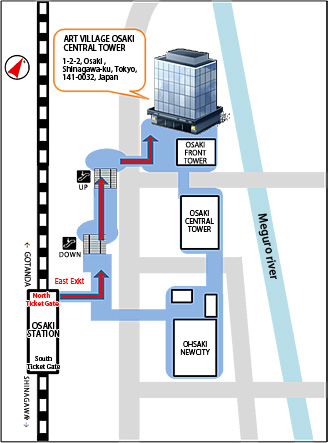 The front of Osaki satation. In use of Metropolitan Expressway, each lamp of Meguro, Katsushima, and Oi is useful.